When it comes to trail running, Florida is underrated. Sure, the Sunshine State might lack hilly terrain and high altitude, but there is no shortage of challenging trails through breathtaking scenery. That’s what makes the 11th annual Florida Challenge Half Marathon & 5K Trail Run on Sunday, Jan. 26 at 8 a.m. one of our favorite races. Held at beautiful Alafia River State Park, just east of Tampa, it’s perfectly situated on the race calendar before triathlon season and amid a crowded road race calendar. It’s rated one of the top trail runs in the country, with hillier trails than you’d expect. 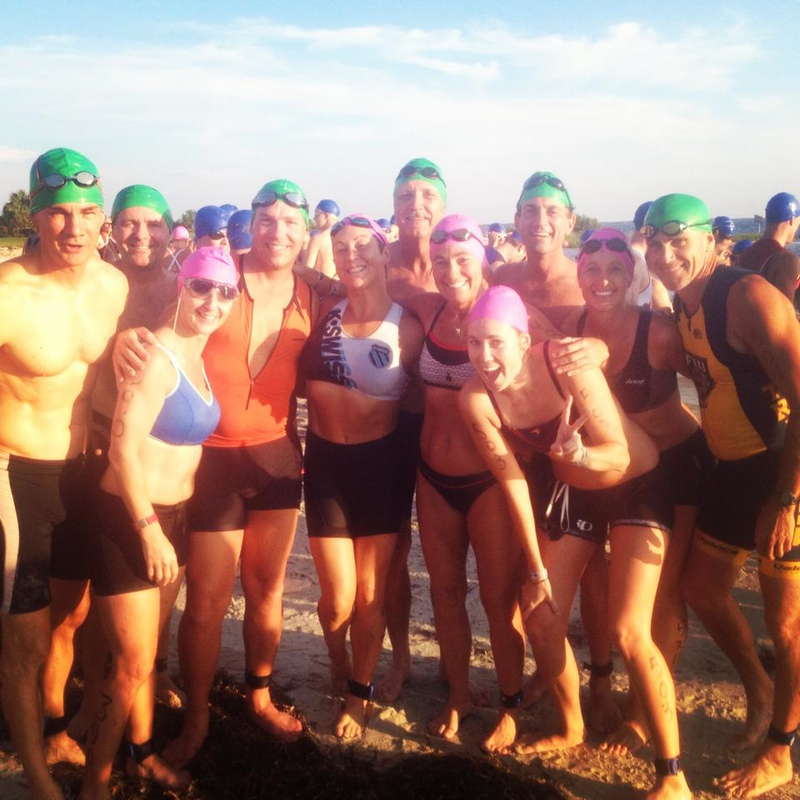 It’s also one of the better values in Florida endurance sports. Race-day registration is just $35 for the 5K and $45 for the half marathon (early sign-up rates were even lower). 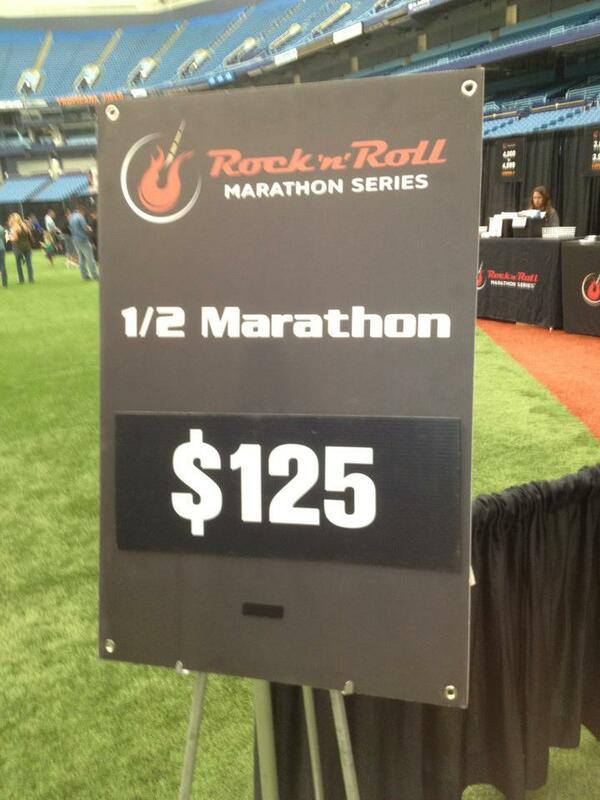 At a time when it costs $80 to pound the asphalt and pavement of a road half-marathon, that’s a bargain. History: Race debuted in 2004 and is one of a number of popular off-road running events put on by Tampa Races, which also stages the Picnic Island summer adventure run series, along with the XTerra Florida Trail Run series. Format: The Florida Challenge is a 13.1 mile and a 5K trail run on beginner and intermediate single track trails. The half marathon starts at 8 a.m. and the 5K a half hour later. Amenities: Long-sleeve T-shirts, custom awards for top finishers, catered post-race food. Cost: Online registration closing Jan. 23. 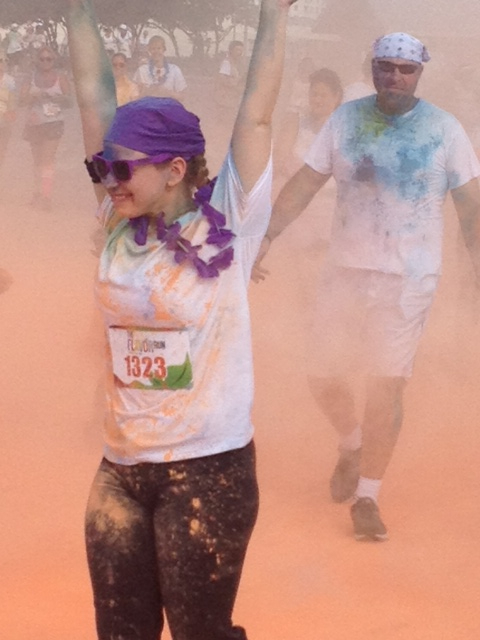 Race-day registration available – $35 for 5K, $45 for half marathon. Perhaps it’s not as grueling as an Ironman Triathlon, but racing two triathlons in one day presents its own set of challenges. Just finding two relatively close events on the same day, one in the morning and one in the evening, is difficult. 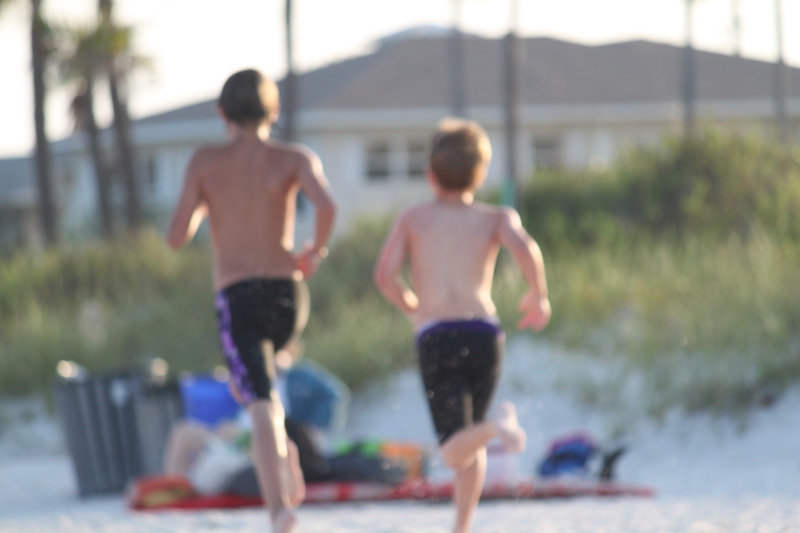 Heck, Saturday’s scheduling of the Top Gun Triathlon at Fort DeSoto Park in St. Petersburg and the Twilight Triathlon in Crystal River might be (for the second straight year) the only opportunity in North America. Evening triathlons are unusual. It’s much easier to shut down roads in the early morning hours. Race directors do not have to provide much additional lightning or require racers to have their own. Triathletes tend to be morning people anyway and prefer to race as the sun rises. But the novelty of completing two triathlons in one day – even modest sprint distance events – was too much for about 60 of us to pass up last year. By all accounts, there will be more of us on hand on Saturday. It’s not so much the distance of the races – quarter-mile swims, 10-mile bikes, and 5K runs – that are as short as it gets for sprint events. It’s the two-hour drive between race venues. Even if you live midway between them it’s a challenge to grab a few hours sleep. Assuming you get up at 4 a.m. for the 7 a.m. Top Gun start, you’ve already been up for 15.5 hours (and completed a triathlon) when you get in the water for the Twilight event. If you’ve never raced a triathlon in the evening, you’re in for a treat. 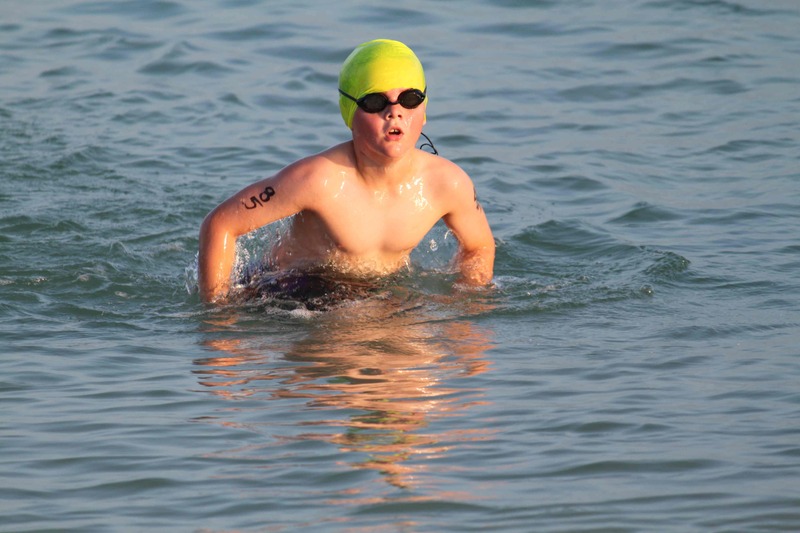 I started doing the Twilight Triathlon in 2010 when it came a week before Top Gun. Then last year with leap year the calendar shifted and the events ended up on the same day and have remained there. It’s possible to do two obstacle races in one day since start times go on well into the afternoon. With so many OCR events, just do one at 8 a.m. and a nearby race at noon or later. 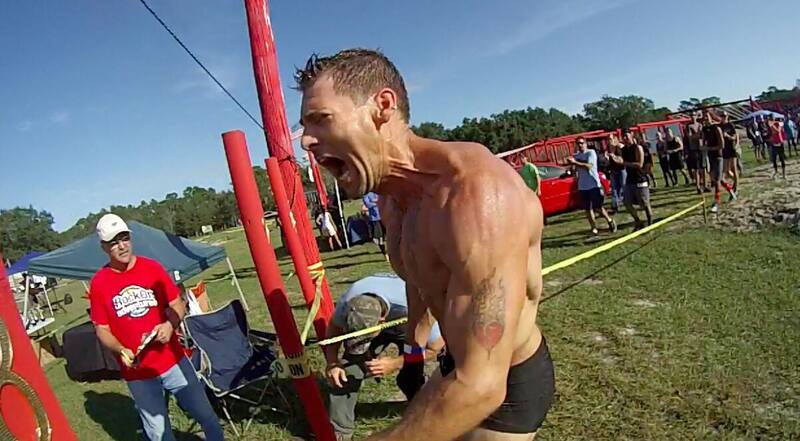 I’ve done two OCR events in one day, an OCR event at night (last Saturday’s Mud Endeavor at the Pasco County Fairgrounds) and even a triathlon (Escape from Ft. DeSoto) and obstacle event (Savage Race) on the same day. But this is the only shot we get at two triathlons in one day. The most impressive performance likely will come from Whit Lasseter, a thirtysomething fitness guru from South Tampa who will do her first triathlon and then her second in one day. That’s got to be a first. Racing at night is a blast with the breathtaking sunset and the sight of hundreds of blinking bikes in post-race transition. With two events, it’s not a day for PRs, but perhaps the most memorable triathlon race experience of the year. 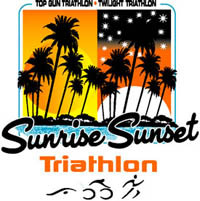 Listen to Twilight Triathlon race director Chris Mohling discuss the Sunrise/Sunset Triathlon Challenge on The Fitness Buff Show HERE. TAMPA, Fla. – At 9 on a Friday morning, Michael Poole jogs a lap around the trails by the University of South Florida’s tennis courts. His new orange Saucony shoes leave imprints in the dirt. The warm up barely makes him sweat, but his hair is wet from the swimming workout just before. His lean body stands at 6-foot-1-inches and his skin is tan from being in the sun for years. This morning his training is light because the next day he will be racing in Barbados. There he races what he says was the best race of his life. At 21, this New Zealand native spends 30 to 35 hours per week training for triathlons, while balancing a 15-hour course load for chemical engineering. 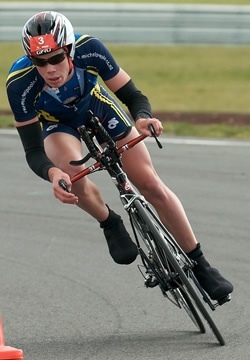 At 18 he began to excel and win race after race in Auckland. At that point in time he made the choice to go pro. In 2012 he was ranked seventh in the U.S.
Poole made decisions that many young people cannot imagine. 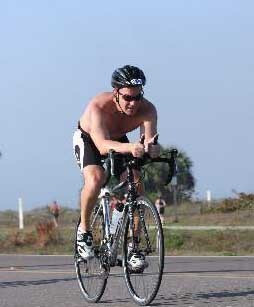 Realizing that his best shot at making a living as a professional triathlete was in the United States, he decided to move to Florida, specifically the Tampa Bay area. His area of study, chemical engineering, serves as his plan B. So he researched what college he wanted to study at with the help of Google. He weighed the qualities of all the universities in the state, the locations and the fees. He decided that University of South Florida was the best place for him. Before Poole moved, he endured a horrific bicycle accident when a car knocked him off of his bike, smashing his face. The driver drove off after the accident. The friend he had been training with called Poole’s mom to rush him to the hospital. “At that moment I really realized I needed to go to college; it could’ve been worse,” he said. Although he now has a fear of cars and sustaining another injury, Poole hasn’t allowed the incident to prevent him from racing. 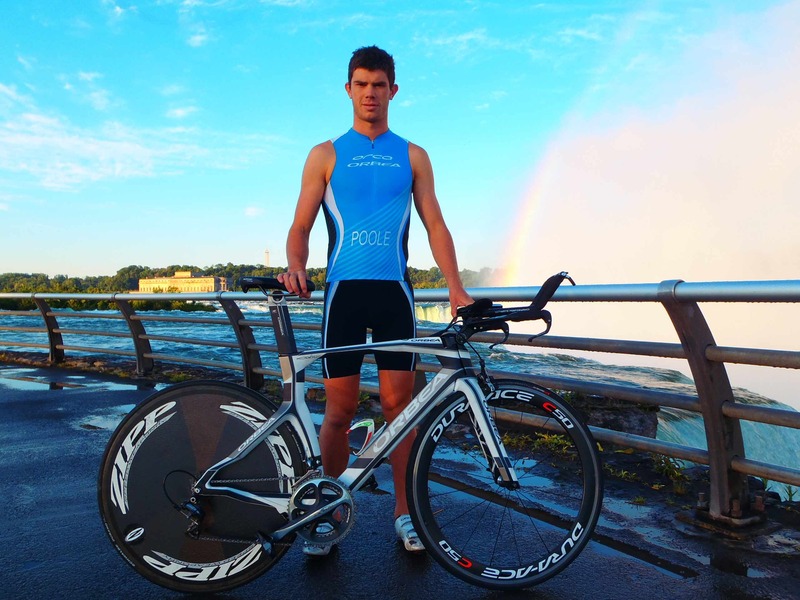 In January of 2010 Poole competed in New Zealand’s Half Ironman Championships and met the professional triathlete standards. “It’s not complicated to stay a pro, I just need to be consistently getting top placings in races,” he says. He is sponsored by New Zealand businesses like the bike company, Orbea. He receives two bikes and triathlon clothing throughout the year. His sponsors pay for 50 percent of each race’s fees, and Poole must come up with the rest. He manages to use the money he wins to finance his future races. For some of the races he stays in hotels when the race organizers pay for his stay. Otherwise he finds someone to stay with for that weekend. “I have found Americans to be amazingly generous at inviting me into their homes,” Poole says. Poole lives at an apartment alone near the USF campus. He trains by himself. No trainer or nutritionist guides his training. He starts his school days with 5 a.m. workouts and begins exercising later on his free days. He spends five hours every day training. Poole suits up in his Lycra and takes his bike to a park called Flat Woods Park. There he rides a seven-mile long course for three hours. Next he runs in circles around the neighborhoods by his apartment for an hour. Finally, he swims freestyle for an hour and a half at USF’s indoor recreational pool. “In a week I do 250 miles cycling, 60 miles running and 20 miles swimming,” says Poole, who has been away from New Zealand for more than a year. He keeps in touch with his father, Alwyn, who acts as Poole’s agent and coach. Poole misses many things from home like the culture but most importantly his wife who works in Australia. Every other weekend Poole travels to races. He takes a shuttle or catches the bus to the airport. So he doesn’t miss any classes because he usually flies early Saturday mornings and comes back to Tampa on Sunday evenings. This year alone he has competed in 20 to 25 races. His dedication to this career has led him to travel to 20 different states for this sport. 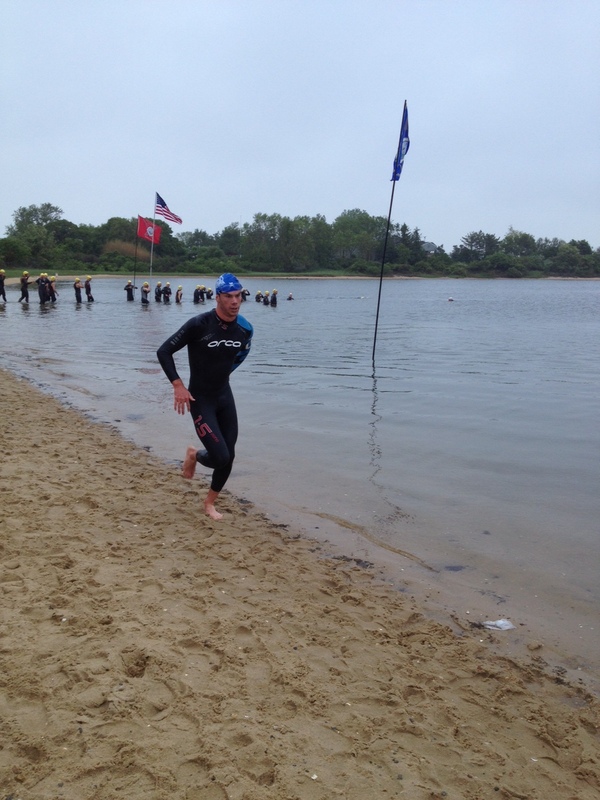 Poole doesn’t focus on Ironman races anymore, but instead concentrates on the Olympic distance races. 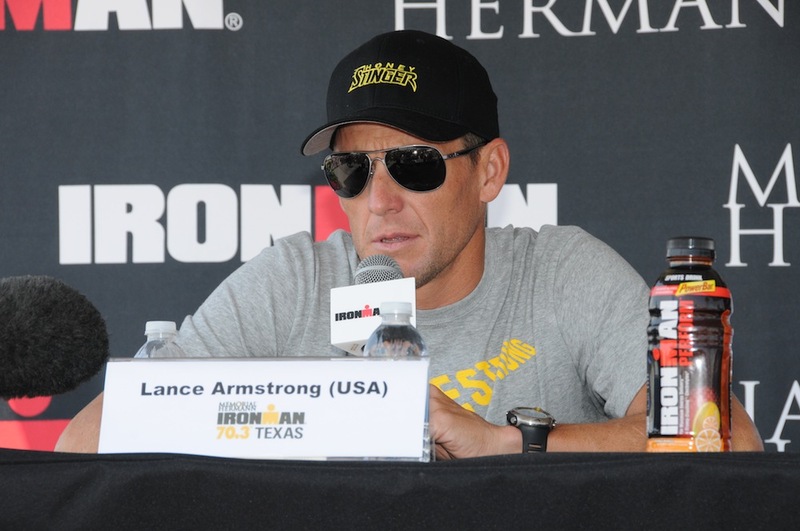 “I no longer do Ironmans as it takes me too long to recover from them so I would rather race Olympic distance races every weekend,” Poole says. His favorite race by far has been the Escape from Alcatraz in San Francisco. The athletes zip up their wetsuits and swim from the former prison through 1.5 miles of freezing waters to the St. Francis Yacht Club. They then bike up hilly terrain for 18 miles and finish by running eight miles along the ocean side. When Poole is not training he is taking five classes two days a week. His favorite thing to eat is Snicker’s ice cream and Asian cuisine. He gets through each race by picturing a bowl of ice cream at the end of it. A sophomore, Poole has two more years to go in school before he can graduate. On average, he wins about $1,000 a race. He pays for most of his living expenses, but he hopes to attract more sponsors so he can provide more financial support for his wife. 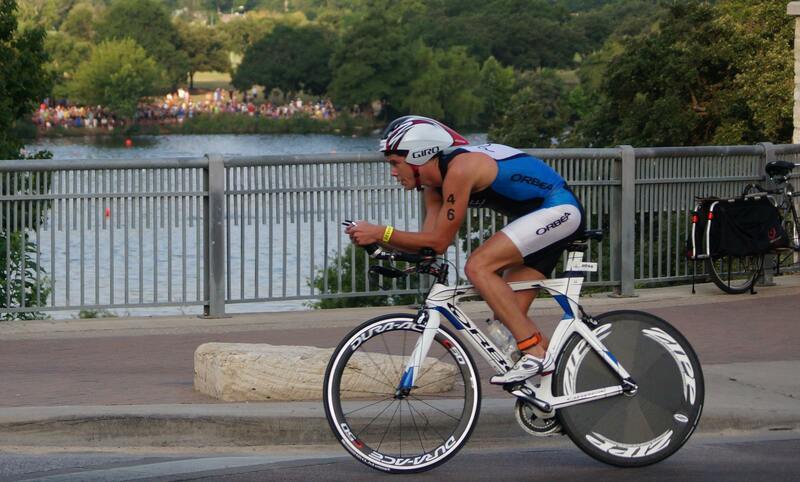 His most recent race took place in Barbados, which was an International Triathlon Union Continental Cup. He placed second. “Must have been a combination of shaved legs and the short run on Friday,” he laughs. Poole hopes to continue to advance in this sport. View Michael Poole’s fan Facebook page HERE. Arnie Goodman slides his legs until they touch the end of his shallow kayak. He grips the paddle and glides along the water flowing through Riverfront Park in Tampa. He’s paddling just as he has done on this day for the past five years. The myeloma cancer is working through his body, dangerously. But Goodman keeps paddling, for himself and for a cure. Goodman, 54, grew up in the waters off Fort Lauderdale. There he boated and sailed through the east coast waves. When he moved to Tampa he was introduced to kayaking, where he fell in love with the sport. “It became my love,” he says. At 47, he was a practicing ear, throat and nose physician and continued to swim and kayak regularly. Then he was diagnosed with myeloma cancer. He, his wife and their two kids stared into what was left of the time that this cancer had cut short. He has dealt with the disease for more than seven years. Since the treatment is so extensive and time consuming, Goodman stopped practicing medicine. 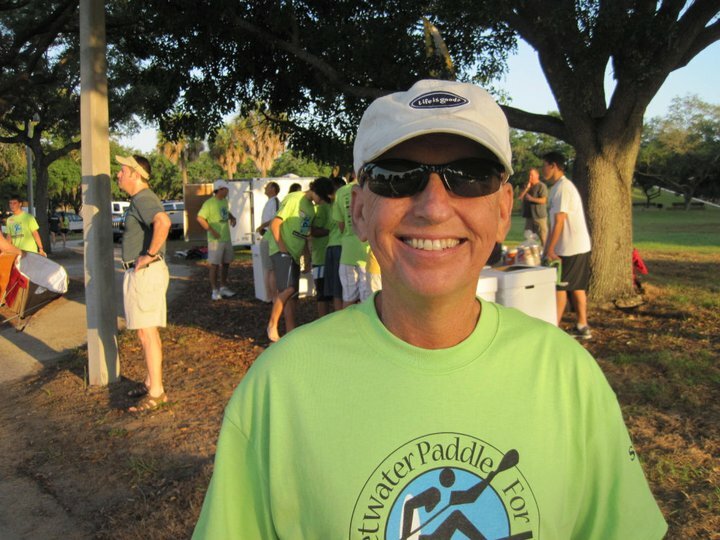 A year after the diagnosis, he formed the non-profit organization, Beat Cancer with a Paddle. 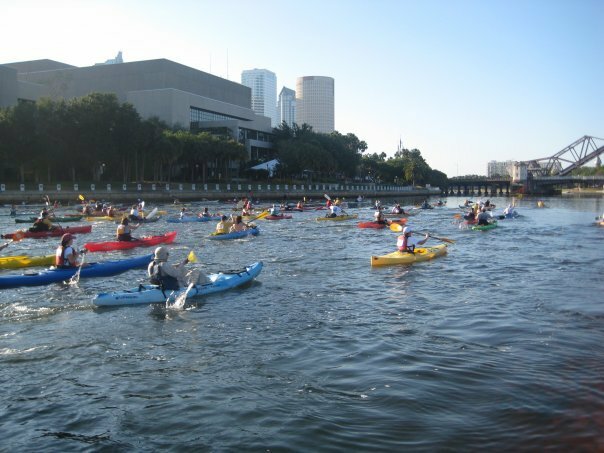 Though the organization, Goodman, Russell Farrow (owner of Sweetwater Kayaks) and other sponsors created the “Sweetwater Paddle for the Cure” race in 2009. 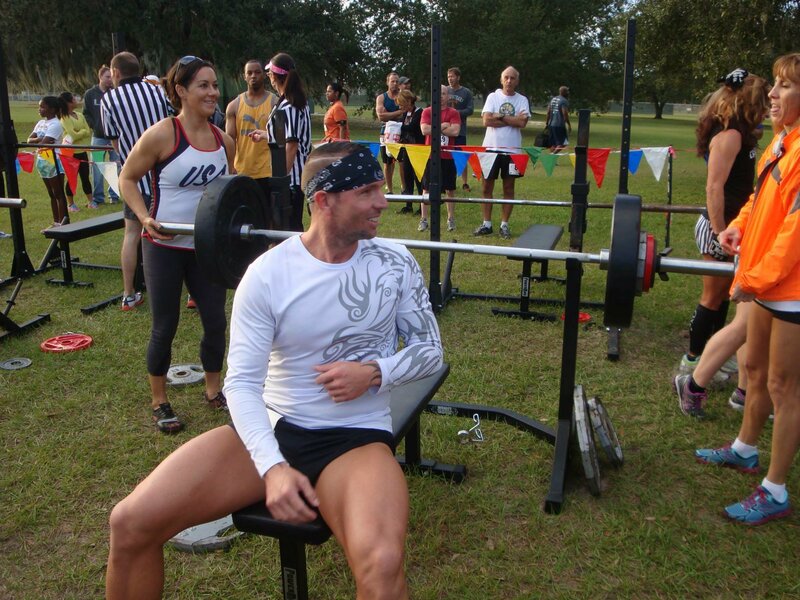 This year’s event takes place on Sunday, May 5 from Tampa’s Riverfront Park. The race started with individuals and groups competing in kayaks. Then one year a man showed up with a stand-up paddleboard. “We thought, who’s this buff guy out there on a surfboard?” Goodman says. As the years have progressed, more and more paddle boarders have accompanied the kayakers. The Sweetwater Paddle for the Cure doesn’t solely include endurance athletes. Parents bring their children to enjoy the day on the water in double kayaks. Beginners come to fall and try again on the kayak and paddleboard rentals. “Paddleboard companies that work with us, Stand Up Paddle Life and Urban Kai, provide the boards and demo for those who want it,” Goodman says. The participants set up in a staggered line. The gun blasts and the racers paddle off. The course takes the boarders down past the Tampa Convention Center and under the bridge. They swirl around three buoys up the channel and then hurry back to the finish. 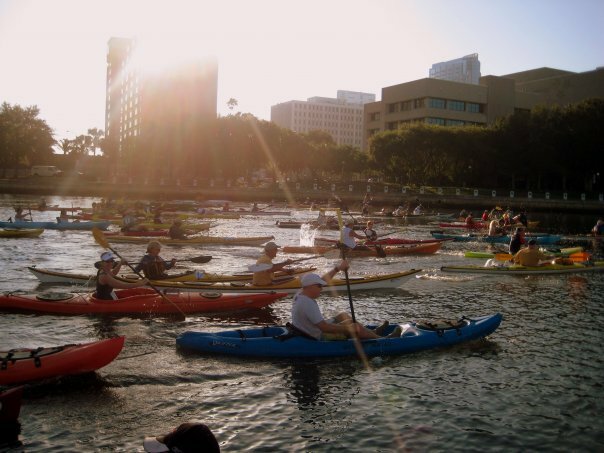 The event’s target audiences are paddlers, newcomers to the sport, and those who come to support the cause. (All proceeds from the event benefit the Multiple Myeloma Research Foundation and Be The Match National Bone Marrow Registry.) The event consists of a 5-mile race for time at 9 a.m. 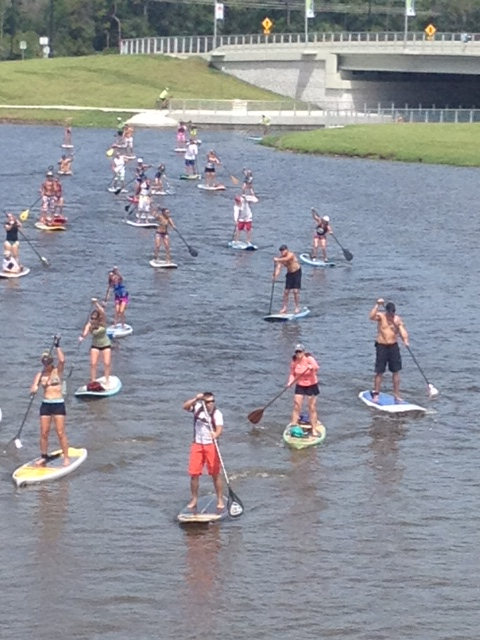 The second race is a 2-mile family fun paddle around the course. The event has raised more than $35,000 since 2009. This is the first year this race has become officially sanctioned by the World Paddle Association. It’s also the first time it will include a tie-in to firefighters. Tampa’s fire department will be volunteering alongside high school students. A unique race called the Firemen’s Challenge Relay will be set up specifically for the different firehouses to put their training to the test. These firefighters will sprint against each other for trophies and the cause. Last fall Goodman endured a bone marrow transplant. He’s also undergone two stem cell transplants. Multiple myeloma accounts for just 1 percent of cancer cases but has claimed the lives of a number of prominent Americans, including Wal-Mart founder Sam Walton, syndicated advice columnist Ann Landers, and former vice presidential candidate Geraldine Ferraro. After treatments, Goodman puts his energy into making this event a success despite how he feels. “It helps me to tolerate the side effects. You have to force yourself to do something even if you don’t feel good,” he says. 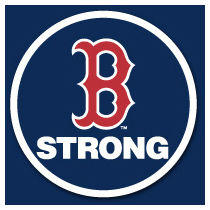 Recently Goodman received an email from a man suffering with myeloma. He expressed that he was coming from his home in New York to do the race. Goodman felt good from the impact he had made to someone in such a personal way. Goodman continues to chug through his life kayaking with the cancer moving through his body like the river does beneath his vessel. Corrie Seabrook is an intern for EnduranceSportsFlorida.com and ObstacleFit.com.